Time for a little something that will, if you're like me, leave you somewhat confused and yet strangely satisfied upon completion. A bit like shagging a fat chick. I'm sure thats not the best way to open a review for a band, but screw it, you'll understand what I'm mean you listen. Because lets face it, the realms of space rock and black metal rarely cross paths. It just doesn't happen, well until this Pittsburgh five piece picked up their instruments at least. 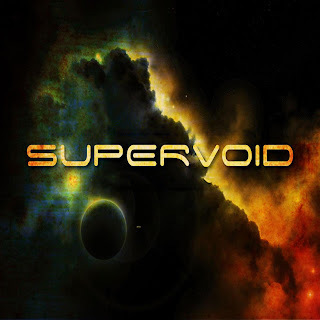 Supervoid have managed to cross not one boundary but several in one fowl swoop, and done so in just the space of two tracks. Opening to a fuzz of heavy space orientated psych Arcane Groves leads you into almost a false sense of security. Even when the vocals begin to kick in you feel somewhat safe in the knowledge that you're listening to something akin to a none Scandinavian Amorphis. That all comes barreling to a halt a couple of minutes in though when Brian unleashes an unexpected torrent of black metal esque vocals, effortlessly flowing from a deep growl to a screeching higher register. I must admit it initially knocked me off balance and the following couple of minutes of post rock style break down left me utterly baffled. But as soon as you accept and embrace the style it's instantly begins to grows on you. Then by the time the first 10 minutes have passed and you've been treated to additional elements of desert rock, post metal and prog, all interspersed with intermittent barrages of screaming and growling nothing seems at all out of place. The guys really took a shot in the dark with the mix of genres on this one, it really could have gone either way. Biblically and embarrassingly awful, or refreshing at unique... I'm so glad it turned out to be the latter!